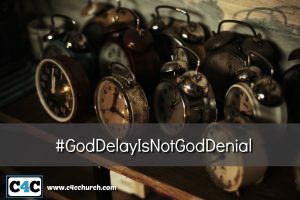 God’s Delay Is Not God’s Denial | Champions 4 Christ Inc. These are wonderful times to be alive. It is clear and true that our whole attitude will determine what we get out of life. In all of our good times, no matter when the times happen to be. There’s always the worst of times for others. Therefore, what determines our good times is our whole attitude, because it’s our attitude that determines our outlook, and our outlook determines our outcome. One of the key things we can do in our life is to write down or make a mental note of at least three things every day for which we are thankful. You’ll be surprised how an attitude and posture of thanksgiving can be. It will focus you on things for which you are appreciative and grateful, and it sends a rush of positive energy in your way. I’m talking about the power of God, and how the power of God will come and help you. Hope will come your way. Joy will come your way. Love will come your way. All kinds of positive things will happen and come your way. One of the things that happens when you focus on looking at each day for at least three things for which to be thankful is, it will change your whole attitude and your perspective about life. It will cause you to start zeroing in on the things to be thankful for. My daily prayer and meditation includes me saying, “I will bless the Lord at all times and His praise shall continually be in my mouth, my soul shall make its boast in the Lord and the humble shall hear of it and be glad, oh magnify with me and let us exalt His name forever. I also, say This is the day that the Lord has made, I will rejoice, and be glad in it. Now, I also find some stuff to get aggravated, irritated and agitated about, whether it’s just driving through traffic, listening to nonsense or whatever irks me but I am not looking for the things that aggravate me. I am looking for the things that will cause me to rejoice. I do that on purpose. So I am on a mission possible, every single day. So, whatever you are looking for, the anticipation of what you expect, will change your whole attitude. One of the reasons that kids are so excited on Christmas Eve is because of what they expect the next day. They don’t care whether you put them on punishment and tell them that they got to go to bed early. When there is a positive expectation on the inside of you, something changes. You know why? It’s because Expectation Causes Preparation. You don’t get what you want in life. You get what you prepare for, and expectation causes preparation. So, more than anything else, Expectation Causes Preparation.